At a time when our world feels more divided than united, Ben and Jerry’s have taken a stand calling everyone to come together. After all, love still trumps hate. Jack Layton, you were a good man. Today was a sad day. 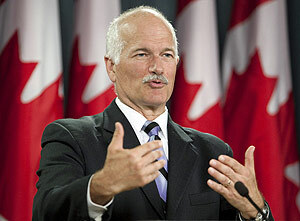 Jack Layton, New Democratic Party leader of Canada passed away. He will be sorely missed. Regardless of political affiliation, you have to admire Jack for his optimism and genuine desire to make Canada, and the world a better place. Even in death his work and vision will live on and continually inspire people. The very first time I voted, once I turned 18, I voted NDP and it was because of Jack. He made me believe in change and in the good in people. I was fortunate to meet him a few times while I was in university and he was sincere, encouraging and listened intently. Below is a copy of his last letter, as published in the Globe and Mail. We’ve done remarkable things together in the past eight years. It has been a privilege to lead the New Democratic Party and I am most grateful for your confidence, your support, and the endless hours of volunteer commitment you have devoted to our cause. There will be those who will try to persuade you to give up our cause. But that cause is much bigger than any one leader. Answer them by recommitting with energy and determination to our work. Remember our proud history of social justice, universal health care, public pensions and making sure no one is left behind. Let’s continue to move forward. Let’s demonstrate in everything we do in the four years before us that we are ready to serve our beloved Canada as its next government. I have been privileged to work with each and every one of you. Our caucus meetings were always the highlight of my week. It has been my role to ask a great deal from you. And now I am going to do so again. Canadians will be closely watching you in the months to come. Colleagues, I know you will make the tens of thousands of members of our party proud of you by demonstrating the same seamless teamwork and solidarity that has earned us the confidence of millions of Canadians in the recent election. On May 2nd, you made an historic decision. You decided that the way to replace Canada’s Conservative federal government with something better was by working together in partnership with progressive-minded Canadians across the country. You made the right decision then; it is still the right decision today; and it will be the right decision right through to the next election, when we will succeed, together. You have elected a superb team of New Democrats to Parliament. They are going to be doing remarkable things in the years to come to make this country better for us all. All my life I have worked to make things better. Hope and optimism have defined my political career, and I continue to be hopeful and optimistic about Canada. Young people have been a great source of inspiration for me. I have met and talked with so many of you about your dreams, your frustrations, and your ideas for change. More and more, you are engaging in politics because you want to change things for the better. Many of you have placed your trust in our party. As my time in political life draws to a close I want to share with you my belief in your power to change this country and this world. There are great challenges before you, from the overwhelming nature of climate change to the unfairness of an economy that excludes so many from our collective wealth, and the changes necessary to build a more inclusive and generous Canada. I believe in you. Your energy, your vision, your passion for justice are exactly what this country needs today. You need to be at the heart of our economy, our political life, and our plans for the present and the future.